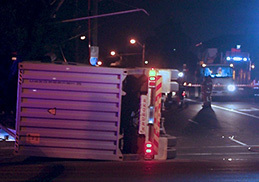 MTAG was formed out of concern about the growing number of trucks using residential streets in Melbourne’s inner west. 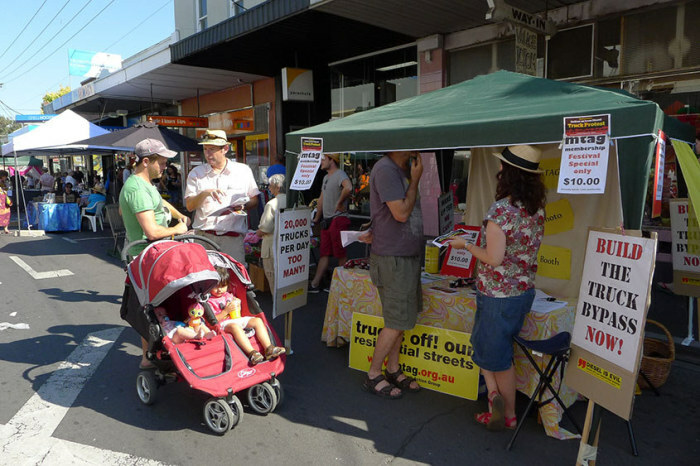 Prior to MTAG’s formation another community group, the YRTG (Yarraville Residents Traffic Group), had been active on the truck issue for over 5 years. Since its formation, MTAG has had a significant impact on raising the issue of excessive truck traffic and the threat it poses to the health and safety of residents. Surveyed each of the candidates running in the 2006 Maribyrnong City Council elections, asking them to rate the importance of the issue of truck traffic as an issue. Almost all candidates nominated it as the most important issue facing this area. This result was widely reported in local newspapers. One of MTAG’s important first steps was to design a website; it now receives up to 1,000 hits a day and has become a destination for anyone studying the issue of truck traffic anywhere in the world. It has also been included in several university studies of the work of community action groups as a demonstration of how digital communications can be harnessed to aid small NGOs such as MTAG. Through this website, MTAG has gathered a large mailing list to which regular email newsletters are sent. MTAG has held regular stalls at local festivals such as Yarraville Festival, Carols by Candlelight and other community events, to disseminate information and gather new members for the group. MTAG urged supporters to participate in a letter writing campaign targeting local newspapers, The Age newspaper, and relevant politicians. Around 30 letters were published. MTAG’s first protest action blocked the intersection of Francis Street and Williamstown Road, Yarraville from 8:00 – 8.30am. This is one of the busiest intersections in Melbourne and carries around 9,000 trucks a day. The blockade was carried out in liaison with Victoria Police and was attended by around 300 residents. Speakers included City of Maribyrnong Mayor, Janet Rice and MTAG convenor, Peter Knight. The protest action was filmed by helicopters for two major news networks and was featured on Melbourne television news bulletins that evening. Other media coverage of the event included stories in The Age and Herald Sun newspapers and interviews on at least five radio stations. The Francis Street action kicked off a huge surge in media interest in the issue which has led to articles and features including: a 10 minute detailed report on truck traffic in Yarraville on A Current Affair, a report on Today Tonight on the effect of diesel pollution on Yarraville residents featuring MTAG health spokesperson, paediatrician, Dr Zoë McCallum; a report on similar issues (again featuring Dr McCallum) in Medical Observer magazine; two major articles in The Age concentrating on different aspects of the issue; and a story on ABC news. In August 2006, MTAG set up a live webcam in the Yarraville Community Centre on Francis Street, Yarraville to allow users to log in and see the trucks for themselves, 24/7. The webcam had hundreds of thousands of hits since it was launched with a flurry of local media interest. The MTAG Community Health Forum is an event of which MTAG is particularly proud. It brought together a comprehensive panel of experts to discuss the issues around excessive truck traffic in Melbourne’s inner west. The panel members were: Dr Tom Beer (CSIRO diesel pollution expert), Horst “Oz” Kayak (RMIT transport expert) and Cr Janet Rice (Chair of the Metropolitan Transport Forum). In addition, Martin Wurt (Oxfam) contributed a brilliant DVD presentation and valuable input also came from Royal Children’s Hospital paediatrician, Dr Zoë McCallum. The forum was widely reported in the media, particularly on the ABC which carried a feature story. The forum was funded and made possible by the Maribyrnong City Council. In the run-up to the 2006 State Government election, MTAG was led to believe, by Government sources, that the Transport and Liveability Statement would contain measures to take trucks off the streets of the inner west. However, instead of spending money to alleviate the dangerous situation on Francis Street, Yarraville, the Transport and Liveability Statement allocated $19.1 million for a truck bypass for Plummer Street, Port Melbourne; a street that carries about a quarter as many trucks. The politics were not lost on MTAG: Melbourne Ports, the seat in which Plummer Street lies, was held by a much lower margin than Footscray and it seemed obvious that the money had been spent to shore up local member, John Thwaites. Angered by this decision, MTAG members decided it was time for radical action and embarked on a campaign for a protest vote against Labor. MTAG printed 20,000 flyers and letterboxed most of the electorate. The election result suggested that the MTAG campaign was effective, with a 6% drop in the primary vote for Labor and an average drop of 9% in the booths most affected by trucks. The election also delivered an upper house seat to The Greens’ Colleen Hartland who has a long history of supporting the campaign against excessive truck traffic in Yarraville and surrounding suburbs. MTAG commissioned an independent study to provide insights into the perceived health impacts on residents of Yarraville and Footscray caused by increased truck traffic. The Truck Traffic Impact Survey was designed to measure the effects on residential amenity in areas that experience excessive levels of truck traffic and had an excellent level of response. The survey results and questionnaire feedback was collated and independently analysed by a high profile firm specialising in the interpretation of qualitative research. The study provided some measure of the effects of truck traffic as experienced by residents in the inner west in addition to insights into residents’ perception of truck traffic impact on their lives. 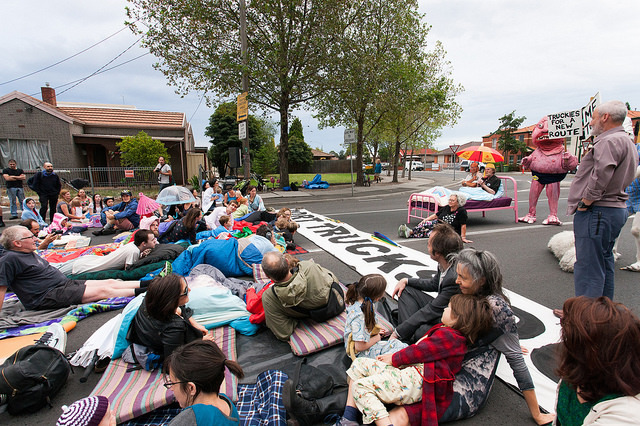 MTAG, together with more than 200 local residents, blockaded the intersection of Francis Street and Williamstown Road again, causing major traffic disruptions across Melbourne. This protest action resulted in major publicity for the truck issue and was reported on all major TV news and daily papers in Melbourne and national news websites. MTAG met with Rod Eddington, who had been chosen to lead the State Government’s East West Link Needs Assessment Study. MTAG submitted a 25 page submission outlining action needed to reduce truck numbers. 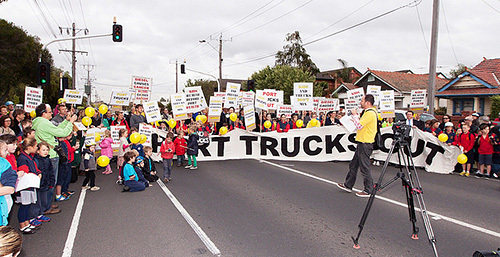 MTAG organised a major family protest march against trucks on residential streets. Over 400 people attended resulting in major media coverage on national and state TV, national newspapers and state papers including The Age and Herald Sun. Listen to ABC radio Jon Faine interview here. Watch channel 2 coverage here and channel 9 coverage here. The Eddington East West Links Needs Assessment Final report was released. The Truck Action Plan included all of MTAG’s submission recommendations including an MTAG map showing proximity of the community to major truck routes and the number of trucks using residential streets. 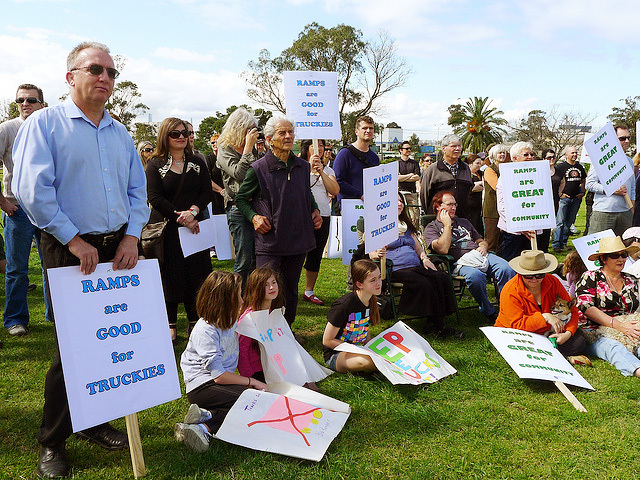 MTAG forms a coalition calling for the East West Links truck ramps to be built. The Coalition includes truck drivers, the No Freeways for West Footscray group, prominent local Labor identities Cr Michael Clarke and Wade Noonan MLA (member for Williamstown), along with Greens councillor (and former chair of Metropolitan Transport Forum) Janet Rice, public policy analyst Dr Russell Solomon (who was also the chair of the owner’s corporation of the apartment complex at 61 Francis Street), and a host of other community figures. The State Government released its much anticipated Victorian Transport Plan. The Truck Action Plan Stage 1 called for a dedicated truck route through industrial areas of Yarraville, with new on/off ramp connections to the Westgate Freeway as supported by MTAG. Stage 2 of the Truck Action Plan called for a major new tunnel under Footscray, which MTAG did not believe would solve the truck problem in Yarraville and Footscray. Watch channel 7 news coverage here. The Eddington East West Links Needs Assessment Final Report brought MTAG a new level of respect from the State Government. For the first time, the Government initiated talks with MTAG to discuss the Truck Action Plan and other truck related issues. MTAG met with the Government, including Transport Minister Tim Pallas, several times throughout 2009. In 2009 MTAG had numerous meetings with VicRoads to discuss planning and routes for the Truck Action Plan Stage 1. MTAG long suspected the Truck Height Detection cameras installed on Francis Street were ineffective in identifying and fining curfew breaking trucks. FOI proved our concerns to be well supported. In almost 3 years of operation, the cameras had resulted in 2 infringement notices to the same driver on the same day. The cameras were found to be inoperative and not certified to issue fines, plus the quality of the images were so poor that 90 per cent of images required extra software and processing to read licence plates. Also, there was no record of the cameras being serviced or records of the cameras actually being in operation. It is suspected they were out of commission for over 1 year. MTAG started a campaign against curfew breaking freight company, Chalmers. Chalmers had relocated their head office in 2009 to a location just outside of the curfew zones. However,MTAG found they were continuing to run their trucks through Yarraville, breaking the curfews which only permit local trucks during curfew hours. The MTAG campaign – with support from local politicians – led to Chalmers stating they would obey the curfew. MTAG issued a Media Release with its finding on the height detection cameras. The story ran in daily papers including the Herald Sun and on the front page of local papers. ABC radio’s Jon Faine interviewed MTAG and Channel 7 News ran a major piece on MTAG’s findings. MTAG travelled to Sydney to meet with Infrastructure Australia to lobby for funding for the Truck Action Plan. This was the first time a community group has directly lobbied Infrastructue Australia. MTAG launched its Facebook page enabling it to embrace social media to assist in campaigning. The Facebook page has hosted many a lively debate. 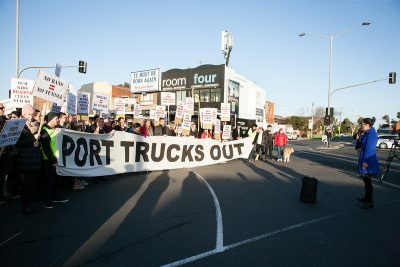 MTAG supported Less Trucks for Moore (LTFM) with their first protest action blockading the intersection of Moore and Buckley Street in Footscray. MTAG’s Martin Wurt travelled to Los Angeles as a guest speaker at the Moving Forward Together Conference. The conference, attended by over 600 people, bought together communities from around the world who are impacted by the international movement of trade. 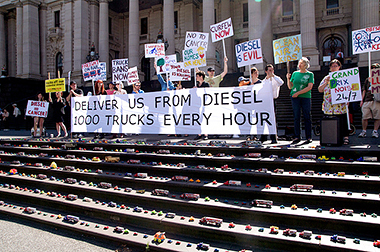 In the lead to the State Election, MTAG placed 1,000 toy trucks on the steps of Parliament House to symbolise the number of trucks the inner West experiences every hour. There was great coverage in newspapers, and on radio and TV. MTAG took a major role in organising the Westgate Ramps Coalition Rally at Yarraville Gardens. Speakers from each of the Coalition partners spoke, with about 200 members of the public attending. Media coverage included local papers and TV. Following extensive lobbying by MTAG, the Victorian EPA commenced air monitoring for 12 months on Francis Street. 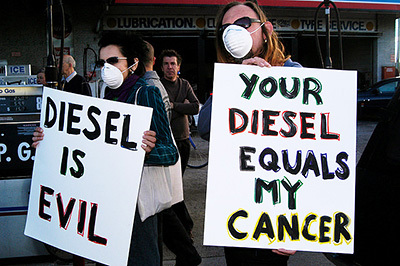 In 2012 the World Health Organisation (WHO) declared diesel exhaust to cause cancer. Previously it was considered “probably carcinogenic”. It is now ranked by WHO as a Class 1 carcinogen; in the same class as tobacco smoke, asbestos and mustard gas. MTAG protested outside the Hilton Hotel in Melbourne where CEDA, the Committee for Economic Development of Australia, was holding a conference: Australia to the world: Growing national port infrastructure. MTAG told a Planning Panel (Maribyrnong Planning Scheme Amendment C89, Former McCall’s Tannery Site, Yarraville) that redundant industrial land on Francis Street should not be rezoned to allow up to 100 new dwellings until after something was done to reduce the number of trucks. The Panel agreed that addressing the issue of heavy vehicles should be a priority for existing and future residents, and said, “there is little doubt or disagreement that Francis Street is a hostile environment in its current form for much of the time for pedestrians and cyclists, driven largely by the heavy vehicle component of traffic”. However, the Panel felt it could not rely on this to recommend against the Amendment, and the land was subsequently rezoned. MTAG launched an online petition to call on Premier Baillieu to build a truck bypass. MTAG, together with more than 200 supporters, blockaded Shepherd Bridge in Footscray. The bridge is the major river crossing for all westbound truck traffic accessing the Port of Melbourne. This peaceful protest was reported in The Age, Herald Sun, local papers, evening TV news and in a major interview with ABC Radio’s Jon Faine. MTAG began participation in Maribyrnong City Council’s Truck Review Committee set up to investigate the effectiveness of the two current truck curfews on Francis Street and Somerville Road. The Napthine Government announced it had scrapped the Truck Action Plan and would instead prioritise the East West Link, starting in the east only. Following an application to VicRoads to allow HPFV’s (High Productivity Freight Vehicles) on Yarraville streets, MTAG launches an online petition. Targeting VicRoads, Maribyrnong City Council, the Roads Minister and the Heavy Vehicle regulator, the petition aimed to block the application that would see HPFV’s on Francis Street, Whitehall Street and Williamstown Road. MTAG was accepted as a speaker at the 5th Annual Victorian Infrastructure Conference, sharing the stage with Mr Terry Mulder (Victorian State Roads Minister), Mr Steven Bradbury (CEO Melbourne Port), Robert Freemantle (Executive Director Policy & Programs VicRoads), Michael Kilgariff (CEO & Managing Director Australian Logistics Council) and many others. MTAG parcipitated in a Truck Curfew Review organised by Maribyrnong City Council and VicRoads. The review found that the existing curfews, whilst effective on Somerville Road and Francis Street, forced trucks onto other residential streets at night time. Moore Street in particular has seen a 400% increase in night time truck numbers since 2006. PM2.5 are found to be tracking above the annual advisory limit and noise levels are found to be at a level high enough to cause annoyance and disturb speech and sleep. MTAG produced a YouTube video highlighting the impact that trucks have on school children on Somerville Road. The video is instrumental in galvanising community support for Maribyrnong City Council’s push for a school crossing time truck curfew on Somerville Road. 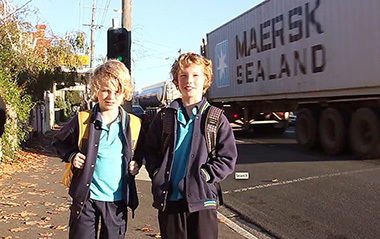 MTAG launched an online petition calling on the State Government and VicRoads to extend Somerville Road’s curfew to include school crossing times. 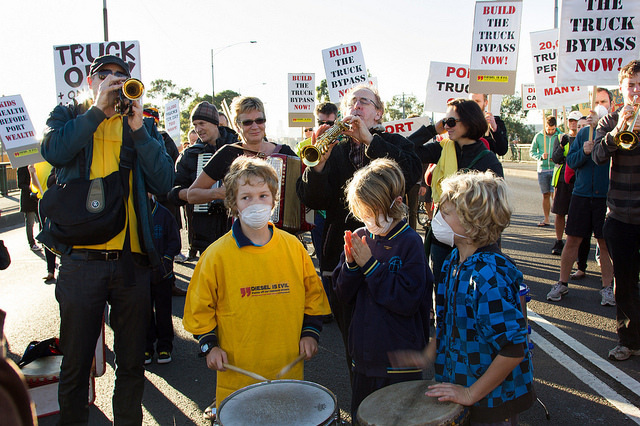 MTAG blockaded Somerville Road during morning peak hour to highlight that Kids and Trucks Don’t Mix. This peaceful blockade saw supporters, parents and kids calling on the State Government to implement school crossing time truck curfews on Somerville Road. It received fantastic coverage on channels 7, 9 and 10 evening news as well as on numerous radio stations. Watch a compilation of the news coverage here and a video of the protest here. The Victorian opposition party launched a new transport policy called Project 10,000, which renewed its commitment to build The Westgate Distributor, a truck bypass for Yarraville using new on/off ramps from the Westgate Freeway through industrial areas of Yarraville to the Port of Melbourne. VicRoads, the Victorian EPA, the Victorian Department of Health and Maribyrnong City Council formed a working group partnership called “Trucks and the Inner West” to consider short term solutions for truck traffic issues in Melbourne’s inner west. The partnership held a number of community forums and also conducted a major truck movement survey. 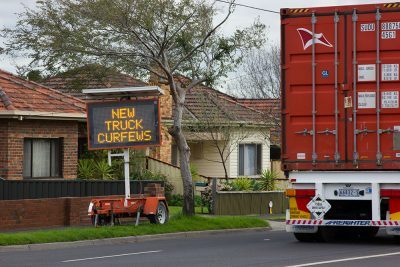 On the table were extended truck curfews on Somerville Road in Yarraville and night time curfews on Moore Street in Footscray. The first public meeting of the Trucks and the Inner West Partnership took place at Maribyrnong Town Hall. MTAG and Less Trucks for Moore held a symbolic ‘Sleep In’ truck protest on Moore Street, Footscray. The protest featured around 150 people in sleeping bags reclaiming the street to highlight issues around night time truck noise. The protest featured iconic Melbourne comedian, Rod Quantock and the Snuff Puppets. In the report, Yarraville was identified as one of Australia’s top 10 pollution hot spots, “with some of the highest diesel pollution levels ever recorded in Australia.” The report explained why our air pollution standards are failing us, in particular the lack of regulation for ultrafine particulate matter, PM2.5. The second community session of the Trucks and the Inner West Partnership took place at Maribyrnong Town Hall. Jointly organised by Environmental Justice Australia, Doctors for the Environment and the Nature Conservation Council NSW, the summit brought home the fact that air pollution is an environmental justice issue. MTAG spoke in the Communities section on the battle to get real solutions to the truck issue in Melbourne’s inner west. At the third community session of the Trucks and the Inner West Partnership the first new curfews in nine years were announced, a school crossing time curfew on Somerville Road and night and weekend curfews for Moore St. This followed several meetings between MTAG and Less Trucks for Moore members, VicRoads, Maribyrnong City Council, the VTA and local trucking operators. It was the first time we had industry, government and the community at the table together in full acknowledgement of the issue working to get real solutions. President of MTAG Samantha McArthur is interviewed on RRR radio about MTAG’s campaign and the recent curfew announcements. The Victorian Labor Party win the state election with their transport policy, Project 10,000. This includes construction of The West Gate Distributor, new on/off ramps to create a direct route for trucks to the Port of Melbourne, and is expected to take 60% of trucks off our residential streets. Labor pledge that this project will be completed within their first term of government. January 2015 – MTAG makes a submission to the Federal Government’s National Clean Air Agreement. MTAG made a submission on air quality in the City of Maribyrnong to the Federal Government’s proposal to update the current national air quality standards. The submissions showed overwhelming public support for stricter air pollution standards and many concentrated on diesel pollution. Submissions are available online here. Two new curfews came into effect, a school crossing time curfew on Somerville Road and a night and weekend curfew on Moore Street. The curfews begun with a media event on Somerville Road attended by Luke Donellan, Minister for Roads, Road Safety and Ports, Member for Williamstown Wade Noonan, Mayor Nam Quach, CEO of the VTA Peter Anderson, Greens MP Colleen Hartland and Adam Maguire, Regional Director, Metro North West at VicRoads. The event received coverage on most channels on the evening TV news. 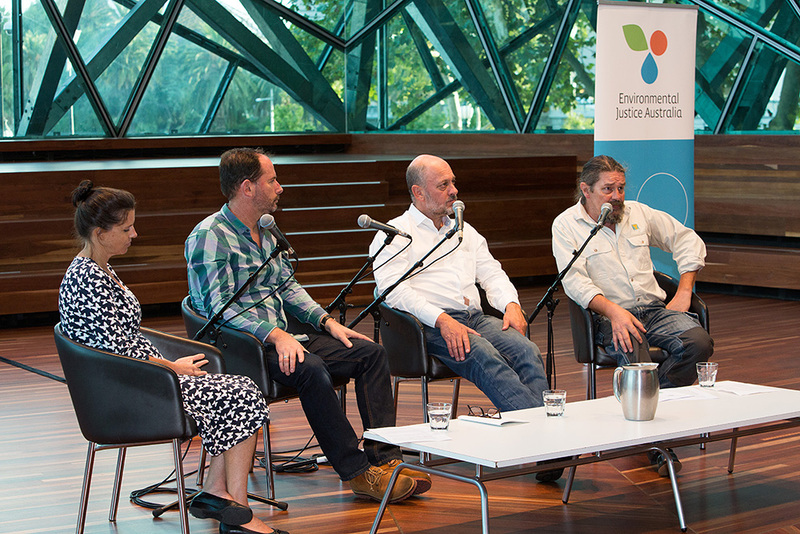 February 2015 – MTAG speaks at an air pollution forum alongside Tim Flannery. MTAG’s Martin Wurt spoke at an air pollution forum, ‘Don’t Hold Your Breath: Is the air you breathe killing you?‘ alongside Professor Tim Flannery from The Climate Council, Ron Ipsen from Voices of the Valley and Nicola Rivers from Environmental Justice Australia. This event, hosted by Environmental Justice Australia and the Sustainable Living Festival, was an opportunity for communities and experts to come together, discuss air pollution issues, and demand strong national air pollution laws. MTAG made a submission to the VicRoads noise reduction policy review as well as to the Federal Government’s Discussion Paper towards a National Clean Air Agreement. Australia’s leading cancer treatment, research and education institute, the Peter MacCallum Cancer Centre, has highlighted diesel pollution and particularly truck numbers in the City of Maribyrnong as a major health concern in a government submission. The submission, titled ‘Clean air. Less cancer’ is a response to a Federal Government discussion paper on a proposed National Clean Air Agreement. The report recommends curfews for trucks in urban areas as well as phasing out old highly polluting trucks. This story was picked up by several radio stations including ABC News as well as Channel 7 News. Toll road operator and owner of Citylink, Transurban, released a proposal to build The Western Distributor, a massive $5billion tollway to connect the West Gate Freeway with the City Link tollway. 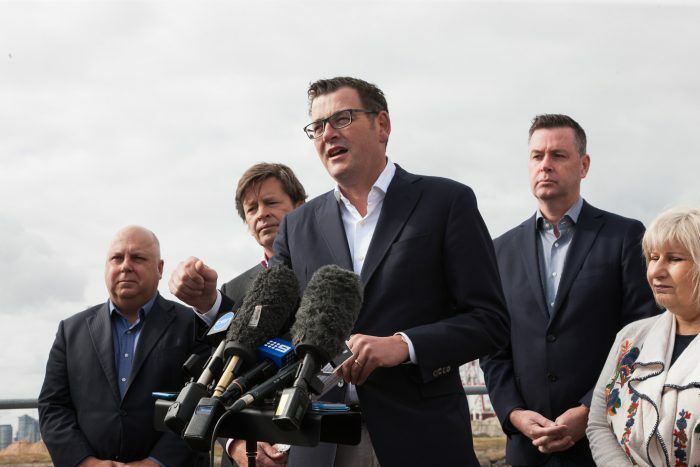 The proposed tollway would replace the Andrews Government’s West Gate Distributor project which they took to November’s Victorian election and would include a tunnel under parts of Yarraville. MTAG were sought for comment by all of Melbourne’s major radio stations, newspapers and TV stations. Watch the TV News compilations here. MTAG met with Transurban, Williamstown MP Wade Noonan, VicRoads, the VTA (Victorian Transport Authority) and Treasurer Tim Pallas’s Chief of Staff and senior advisor on the project. MTAG speaks at a Western Distributor community meeting along with Public Transport Not Traffic and Colleen Hartland Greens MP. Listen to MTAG’s presentation here. The Trucks and the Inner West Partnership reconvened, between VicRoads, the Victorian EPA, the Victorian Department of Health and Maribyrnong City Council, to look at more short term solutions for truck traffic issues in Melbourne’s inner west. Both MTAG and the VTA were also at the table. VicRoads reported on the latest truck counts and launched the ‘Take the Easy Way – Take the Freeway’ campaign along with the VTA. More info here. MTAG made a submission to the second stage of the VicRoads noise reduction policy review as well one to the Independent Inquiry into the EPA. 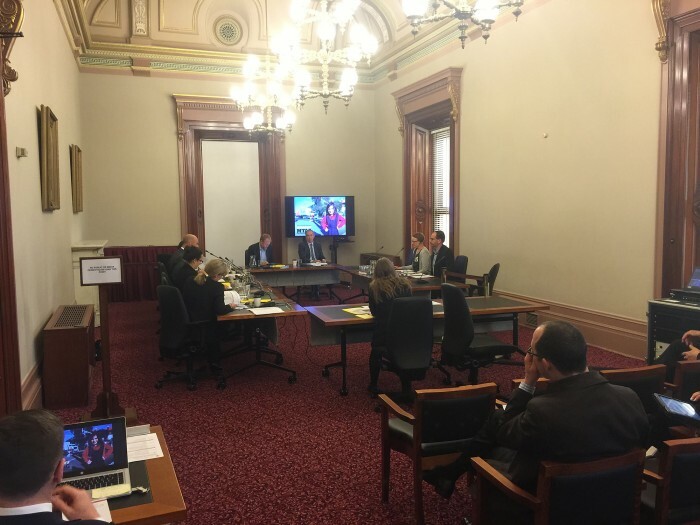 MTAG also made a submission to the State Government’s Inquiry into the proposed lease of the Port of Melbourne and were invited to Parliament House to present at the public hearings. Read the transcript here. Transurban announce an amended design that will have the benefit of giving placarded loads freeway access but will impact heavily on Hyde Street Reserve, Stony Creek and nearby residents. MTAG have concerns about this new design and is sought for comment by all of Melbourne’s major radio stations, newspapers and TV News. MTAG, along with Friends of Stony Creek and Concerned Locals of Yarraville rally together calling for a better solution, including encouraging residents to attend the Transurban community consultation session in Yarraville to voice their concerns. MTAG were invited to present at Environmental Justice Australia’s National Air Pollution Summit along with other clean air advocates, health experts, scientists, lawyers, politicians and community campaigners from around the country. MTAG took part in the ongoing campaign for the upcoming decision from Australia’s environment ministers on a National Clean Air Agreement, to be decided on the 15th December. 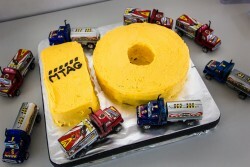 November 2015 – MTAG turned 10! MTAG celebrated 10 years of campaigning and to mark the occasion we launched a mini doco – Port Trucks Out – MTAG’s 10 year fight for truck free streets. MTAG were invited to speak at Melbourne’s Freight Rail Future at Parliament House, an event hosted by Public Transport Not Traffic. MTAG spoke alongside Lead West and Healthy Futures, on the lack of a direct port freight rail link in Melbourne, the impact of trucks in the inner west and the need for a port rail solution now. The Australian Atlas of Healthcare Variation was released, a government report looking at health care rates around Australia. The report found that the City of Maribyrnong has Victoria’s highest rate of children’s asthma and related respiratory admissions to hospital at 171% of the national average. This is reported on widely in the media including The Age. December 2015 – Western Distributor to go ahead. Transurban’s Western Distributor toll road is given the go ahead by State Government. A revised “West Gate Option” is presented and Government and Transurban will now enter a community consultation phase to finalise the design of the portals, connections to the port, connections for placarded loads and city access points. We discussed our concerns around the Western Distributor project and the urgent need for more freight on rail at the Port of Melbourne. We discussed the urgent need for short term measures and made a formal request for an extension of the night and weekend curfews to include Buckley St and Williamstown Rd. February 2016 – Western Distributor Community Demands and Petition launched. MTAG joined local groups Concerned Locals of Yarraville, Friends of Stony Creek, the Yarraville Community Centre as well as The Greens to put out a list of demands regarding the Western Distributor. We also launched a petition calling on the government to ensure best possible outcomes for the inner west. February 2016 – MTAG present to the Parliamentary Inquiry into Infrastructure Projects. 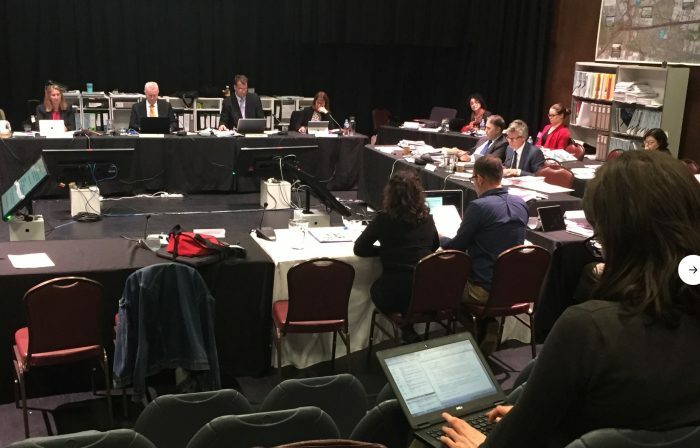 MTAG presented to the Economy and Infrastructure Committee at the public hearing for the Inquiry into Infrastructure Projects, appearing alongside Concerned Locals of Yarraville and Friends of Stony Creek. February 2016 – Environment Effects Statement Scoping Requirements released. The Scoping Requirements for the Western Distributor are released and MTAG puts in a submission. March 2016 – MTAG joins Public Transport Not Traffic and the Public Transport Users Association on the steps of Parliament House to present a petition on the port rail shuttle project. The petition is presented to Samantha Dunn from The Greens to table in parliament. MTAG starts meeting regularly with VicRoads, EPA Victoria, Department of Health, the City of Maribyrnong and the VTA to discuss short term measures. April 2016 – State government announces they will fund the Western Distributor. The government announce they will fund the project without Federal Government support and release three more design options for community feedback. This is followed by another run of community consultation sessions and a request for submissions and feedback on the latest design options. April 2016 – MTAG’s recommendations incorporated into the EES Scoping Requirements. Many of MTAG’s recommendations were incorporated into the Western Distributor EES Scoping Requirements including a requirement that the health impacts of the project are assessed. July 2016 – Francis Street Yarraville gets a school crossing curfew. The Trucks Inner West working group announce that Francis Street will get a school crossing curfew west of Williamstown Rd. This takes effect from Monday 11th July. The State Government announces its intention to build the long tunnel design option for the Western Distributor. MTAG were sought for comment from a variety of news sources. 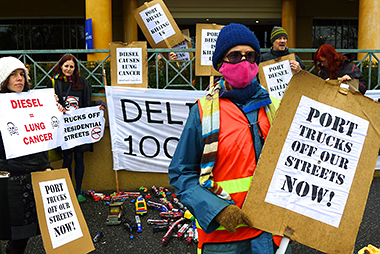 MTAG holds a protest action on the Williamstown Rd and Francis St intersection, calling on the government to commit to truck bans once the Western Distributor is built as well as worlds best practise tunnel filtration. The protest receives news coverage on all the nightly news channels as well as various online and local news sources. August 2016 – State Government announces the implementation of stricter air quality standards. The Andrews Government announces strict air quality standards in line with World Health Organisation guidelines and promises to review the nitrogen dioxide standard. This comes after strong lobbying from MTAG along with many other community groups, health professionals and environmental groups. It’s announced in the media that from 1 November 2016 VicRoads is banning ‘super sized’ B double trucks from the West Gate Bridge as apparently it can no longer take the weight. Instead we find out they are going to be allowed to use Francis Street and Williamstown Road, Yarraville to get to the Port. The community is outraged and MTAG launches a petition and video. Despite opposition from the Maribyrnong Council, VCAT approves a child care centre for the corner of Francis Street and Williamstown Road. This is undoubtedly the most polluted intersection in Melbourne and the proposal receives widespread criticism. 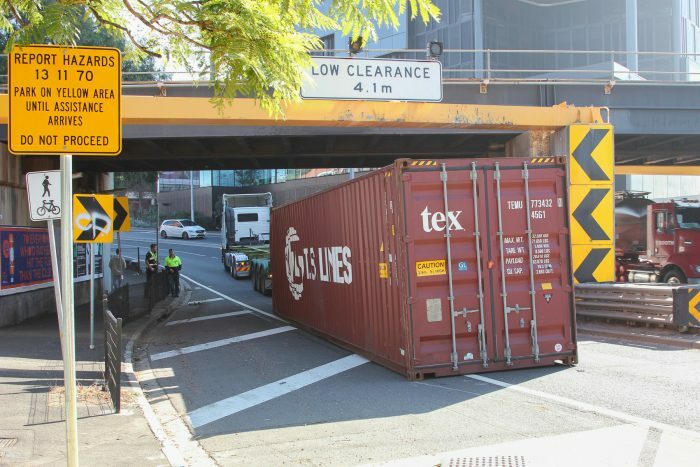 Only weeks after new beams were installed at the Napier St bridge as a safety measure, a truck hit the new beam, causing the container to fall off behind the truck and collide with the car behind. The accident received widespread media coverage. MTAG were interviewed on the ABC Radio news, highlighting the lack of initiatives to deal with port related air pollution on school children in the inner west. MTAG called on Government and the Port of Melbourne to follow the lead of progressive ports in the US who fund air filtration systems in local schools to help students breathe easier. A cyclist was tragically killed when riding her bike south along Whitehall Street. MTAG released a statement calling on government to acknowledge that this is not a safe situation for our community and to act urgently. Three days after the accident 200 people completed a memorial ride from Yarraville to Williamstown. A press conference was held where the Premier announced 24/7 truck bans for Francis St, Somerville Rd, Buckley St and Moore St once the renamed West Gate Tunnel is complete. MTAG were sought for comment from a variety of print and TV news sources. The Environmental Effects Statement for the West Gate Tunnel Project is released, a 10,000 page report. The community has just 30 working days lodge a submission. MTAG releases a list of suggestions for submissions. July 2017 – MTAG makes a submission to the EES and presents to the Inquiry and Advisory Committee. MTAG lodges a major submission to the West Gate Tunnel Environmental Effects Statement focussing on impacts around human health, air quality, tunnel filtration, transport, noise and social impacts. MTAG also presents to the government appointed Inquiry and Advisory Committee, appointed to consider the EES. The State Government announces that the Port Rail Shuttle will go ahead, a project projected to take 3500 trucks off inner west roads every day. MTAG had campaigned heavily to have this project included in the Port of Melbourne lease agreement but it fell by the wayside and was shelved for over three years. Expressions of Interest open with Government expecting to finalise an agreement around May 2018. Planning Minister Richard Wynne approves the West Gate Tunnel Project to go ahead, disappointedly rejecting tunnel filtration and extra truck bans. The City of Maribyrnong, Victoria Police, VicRoads and the Sherriff’s office run Operation Aerodyn, a 6 day blitz which finds more than one third of trucks pulled over on key inner west routes were unroadworthy. The blitz is featured in The Age. Work includes lasers to detect and warn over-height trucks, electronic message boards and traffic lights to stop over-height trucks at the last point before driving under the bridge. The Greens and Liberals join forces to block planning approvals for the WGTP. MTAG puts out a statement expressing our disappointment that this action will either see trucks on our streets for decades to come, or the project going ahead without the safeguards that the planning approvals bring. This was reported on in The Age. 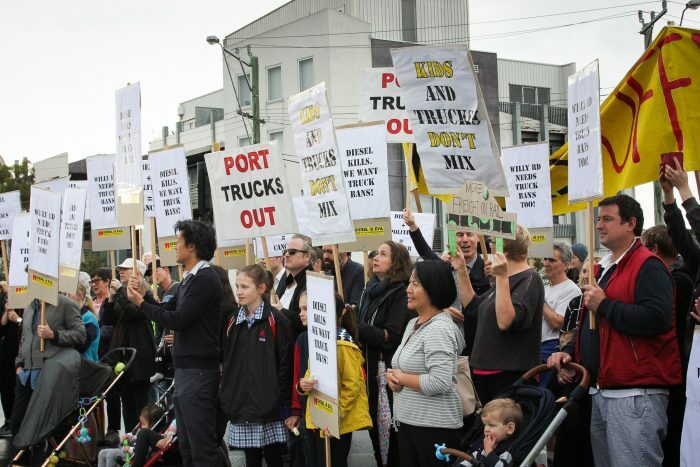 MTAG holds a protest action on the Williamstown Rd and Francis St intersection, calling on the government to include Williamstown Rd in the West Gate Tunnel Project’s truck bans. The protest receives news coverage on Channel 7 and 10’s nightly news as well as ABC Radio. April 2018 – MTAG begin regular meetings with the Port of Melbourne. For the first time in our 15 year history, the Port of Melbourne agree to meet with MTAG. They have assured us that unlike their predecessors, they do want to look at what happens outside the port gate. We agree to begin regular discussions on issues such as freight on rail and cleaning up the trucking fleet. MTAG start getting regular reports from the community that B-Double trucks are regularly using Somerville Rd and are then advised by VicRoads that it’s now a gazetted B-Double route at the request of council. This marks the start of many months of trying to get to the bottom of the issue with council denying that they requested this. Eventually we are advised by VicRoads that they made a mistake on the interactive map supporting the B-double network. Under pressure from MTAG, they promise an enforcement blitz and a targeted media campaign to get the word out to the trucking industry. The issue was covered heavily by local papers. April 2018 – Trucks start hitting the Napier St Bridge after $1.2 million spend on warnings. Two trucks hit the bridge in April, with a container falling onto the road behind the truck. Residents tell us they regularly see trucks ignoring the warning signs and scraping the top of the bridge. With the EPA stopping accepting reports for smoky trucks over 4.5 tonnes, and the National Heavy Vehicle Regulator refusing to take it on, we had to set up our own reporting form for the community to report a smoky truck. The information automatically gets sent to VicRoads Transport Safety Services. The EPA responds by promising to work with VicRoads to put their own reporting system together but nothing comes of it. May 2018 – State Government announce a corridor study of Williamstown Rd and Millers Rd. The study is to look at what can be done about the increased freight volumes as a result of the West Gate Tunnel Project. July 2018 – MTAG make a submission to the Victorian Air Quality Strategy. The State Government calls for submissions to the Victorian Air Quality Strategy, asking Victorians to have a say into how Victoria’s air quality can be improved over the coming decades. MTAG lodge a submission focussing on diesel pollution, upgrading the trucking fleet, freight on rail, air quality mitigation for the West Gate Tunnel Project and clean air initiatives at the Port of Melbourne. July 2018 – State Government announce the establishment of the Inner West Air Quality Community Reference Group. The group is “to investigate air quality across the inner west and explore sources of pollution to find the best solutions for managing air quality and emissions”. MTAG is invited to be in the group and make it clear that we expect independent health and air quality experts to be involved too. August 2018 – MTAG attend the Victorian Government Clean Air Summit. The forum, designed to help shape objectives and actions for the Victorian Government’s Air Quality Strategy. , is well attended by community, government, industry and health and air quality experts. MTAG and the VTA develop the Maribyrnong Cleaner Freight Initiative, to develop road freight improvements for industry and community, providing a transition framework leading up to the opening of the West Gate Tunnel Project in 2022. The Initiative includes new curfews for Williamstown Road and Buckley Street as well as incentives to upgrade to modern cleaner Euro V compliant trucks. The story is featured in The Age. November 2018 – MTAG release their 2018 Victorian State Election – truck policy overview. MTAG survey the major parties on their commitment and policies to address the truck issue in the inner west leading up to the 2018 state election. Overview can be found here.